How do you know how well your sales page or landing page is performing? If you haven’t heard of the term conversion rate, it’s the percentage of visitors that complete a certain action. That action could be to buy your offer from your sales page, or sign up for your opt-in freebie. 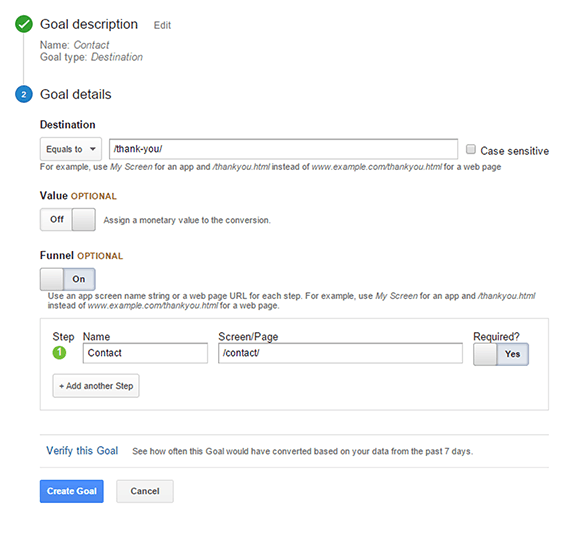 You can track your conversion rate in Google Analytics. You set up a goal, and see where visitors came from and which pages/posts get you the most subscribers or sales. Keep in mind that if you get very few subscribers or sales, the problem isn’t always with the actual page. You might need to get more traffic to the page. If you haven’t already, set up Google Analytics for your site first and make sure to redirect new subscribers to a Thank You page. Go to the Admin area of Google Analytics. From the ACCOUNT and PROPERTY columns, select the property you’re working with. In the VIEW column, click Goals. Click the button to create a new goal. Give it a name that makes sense to you and select the type of goal you want. For subscriber conversion, this should be Destination. You should redirect new subscribers to a Thank You page. That’s the Destination goal you want. The Funnel allows you to set up the path you want people to take to reach the destination page. Since you likely have several pages where people can subscribe, you can leave it turned off. If you want to create a goal to track how many people submitted your contact form vs those who visited the contact page, you’d add the Contact page in the Funnel options, as you can see below. Now that your goals are set up, you can see the results under Conversions > Goals > Overview. The first view is the Goal Completion Location, which is the page you want visitors to end up on. Source/medium shows you where your new subscribers came from. These are sources like Google, Pinterest, Facebook, other social media channels or sites you’re featured on. When you know which source converts best for you, you can work on getting more visitors from those sources. For example, if you get most subscribers from Facebook, you can decide to double-down on your Facebook marketing to get more visitors. Another report you want to look at is Reverse Goal Path. This shows you which pages and posts get you the most subscribers. If a specific blog post is generating a lot more subscribers than other posts, figure out what it is about that post that works so well. You can then use that to improve your other posts. You can also try to get even more traffic to that specific blog post, by promoting it more on social media. Ready to get strategic about your site? 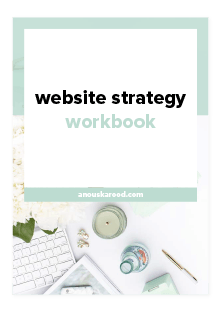 Sign up below to get the free Website Strategy Workbook.